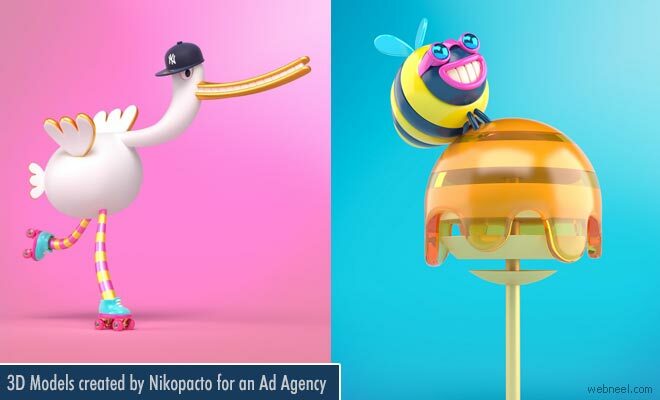 3D Models : Nikopicto is into advertising, animation and art Direction. This funny and cute 3D models were created for OUIGO which is a French rail network and a part of the advertising campaign. The animation comes alive when 10 euros are tossed into the coin slot machine and a pin ball machine gets active. The mini train which is in the shape of a ball moves around several French cities and each of the 3D models are depicted in a fun and entertaining way. When the train reaches paris, it's greeted by Moulin Rouge dancers kicking their legs up in the air. You can enjoy the animation here, just click the link. The catchy soundtrack is "This Head I Hold," by indie band Electric Guest.